Physiological constraints confine our bodies to less than one-fifth of the earth's surface. Beyond that fraction lie the extremes. What happens when we go to them? Dr. Kenneth Kamler has spent years observing exactly what happens. A vice president of the legendary Explorers Club, he has climbed, dived, sledded, floated, and trekked through some of the most treacherous and remote regions in the world. A consultant for NASA, Yale University, and the National Geographic Society, he has explored undersea caves, crossed the frozen Antarctic wastelands, and stitched a boy's hand back together while kneeling in knee-deep Amazonian mud. He was the only doctor on Everest during the tragic expedition documented in Jon Krakauer's Into Thin Air and helped treat its survivors. 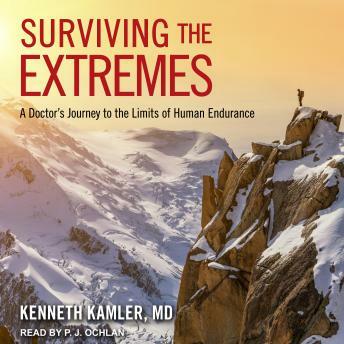 Kamler has devoted his life to investigating how our bodies respond to 'environmental insults'-a nice way of saying the things that can kill us-and watched while some succumbed to them and others, sometimes miraculously, overcome them. Words like 'extreme' and 'survival' have lost some of their value from overuse and media hype. By showing us what happens when life itself is at stake, and the body's capacities put to their greatest test, this book reminds us what they truly mean.